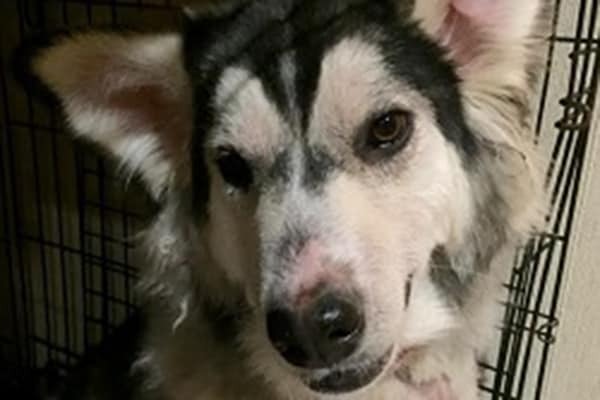 Diefenbaker is a happy, playful approximately 1 year old Husky cross. Diefenbaker was rescued from up North by her previous owners January, 2015. After they got her she became intensly itchy on her abdomen, chin and legs and also started developing an odour to her skin indicating that she was developing a skin infection (before photo on the right). Diefenbaker had a noncontagious mange (Demodex) and skin infection (pyoderma) and was started on treatments of an anti-parasitic, antibiotics and medicinal baths to help with the itching. Her owners decided they could not continue with her medical care so Diefenbaker was donated to the Vetarinary Medical Centre, Western College of Veterinary Medicine. On April 4, 2015, Diefenbaker came to New Hope Dog Rescue for her continued care and recovery and she’s doing GREAT!! She’s got a ways to go yet but she is doing so well (how she looks today on the left)! She will have a lovely coat very soon! You can see how far she has come by her before and after photos! Update (June 20, 2015): Diefenbaker is doing so well! Her fur has grown back and she’s doing so well! She’s such a lovely girl and has been adopted!!!! 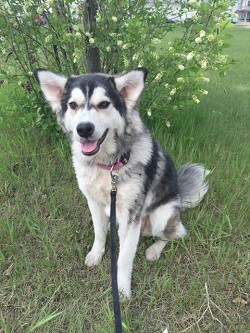 You can help make sure that Diefenbaker and others like her can get the help they need by making a donation to New Hope Dog Rescue!